Gallagher's West - Walk to Ski Resort! Bumper Pool, TV and Cozy Fireplace! 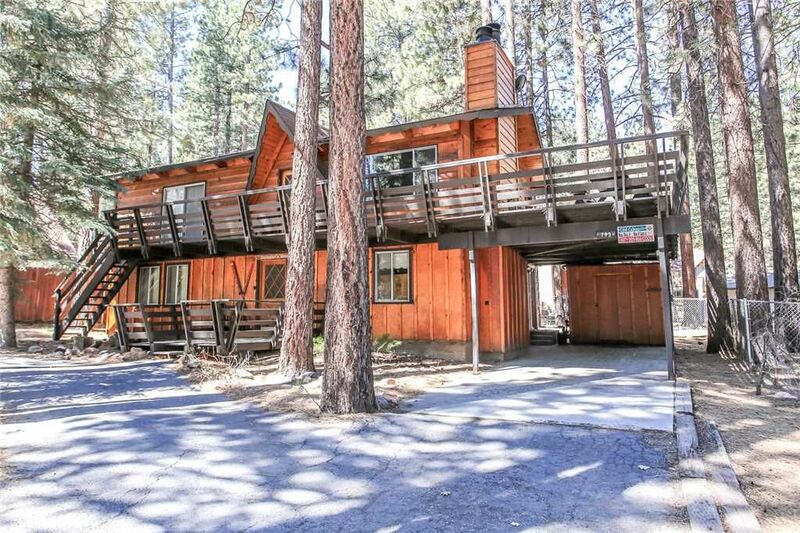 Gallagher's West - Four bedroom, two bath, two story cabin very close to Snow Summit with two wood burning fireplaces, 3 TVs with Dish Satellite, 2 DVD players, and washer/dryer. Fitted with all the conveniences of home, Gallagher's West has a full kitchen with stove/oven, refrigerator, dishwasher, microwave, blender, toaster, coffee maker, dishes, pots/pans, and more. Enjoy a game of bumper pool in the family room with TVs (no cable/satellite), DVD player, and wet bar. Deck in the pines and barbecue. Walk to Snow Summit, lake, shops, and restaurants. Bedroom One - king bed, downstairs. Bedroom Two - king bed, downstairs. Bedroom Three - two double beds, TV, deck, upstairs. Gallagher's West comes with fresh towels, and beds are made up with fresh linens and plenty of cozy blankets. Our dedicated cleaning crew has the cabin clean and ready before your visit and does the cleaning after your stay. Sorry, but Gallagher's West does not allow pets. Overall our stay with the Gallagher's West is nice. The location is very convenient. It's close to the snow summit which is a plus if you have kids that loved to snow board or ski. It's also close to market so we can just drive 5 mins and we are at the store. The cabin is cozy but outdated.. It needs some touch up. The TV downstairs aren't working properly. When you turn it on it'll work for a little bit then it will make this squeaking sound that will hurt your ears. They also don't provide WiFi so for those of you who don't have a carrier that have signal on that area, you will have to drive down to the main street to get a signal. Overall though it's alright. Hi Kennellie. Thank you for your feedback on this cabin and we will definitely look into having these things replaced/added. Thank you for letting us know so we may improve and make our cabins better for you and other guests. We hope you will return to Big Bear soon and stay with Cool Cabins again soon! This property is not well maintained by its owners. The mattress, bedding, and some of the furniture is very worn out and in poor condition. We were all unable to sleep on the mattress, most had dips in the middle. You could feel the springs. The lighting throughout the home is very dim. You get no cell service throughout the home. We did not go expecting luxury but please provide your future guests with comfort. I would not stay here again nor do I recommend it. Unless they update the property and provide their guests with some comfort.